Yori (http://www.malsmith.net/yori/) is an interesting take on what the Windows command line console should be able to do. Highlights are native command aliasing and enhanced tab completion, as well as the less evident internal use of a '\\?\...' based syntax to reference filesystem objects, making it less prone to being tricked. Documentation is scant, to say the least, but Yori is FLOSS released under a MIT license in both 32 and 64-bit versions that, as expected, behave portably if (Uni)extracted. Yori comes with an extensive list of both internal and external commands, mostly fashioned after a mix of Windows and Linux default ones -- one thing I found distracting and annoying was the lengthy license notices displayed when consulting help, exceeding by far any help provided. 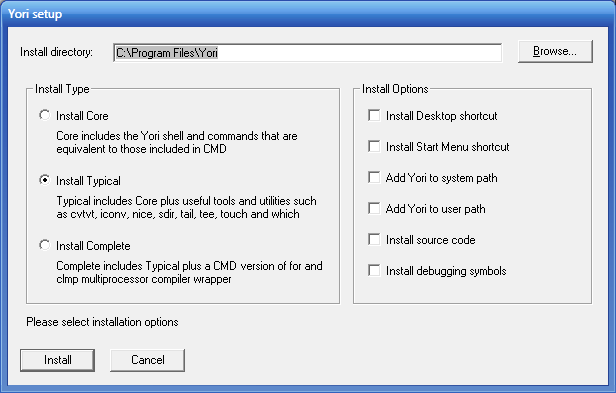 Yori is a CMD replacement shell that supports backquotes, job control, and improves tab completion, file matching, aliases, command history, and more. Download Yori latest release (currently v0.95, dated 2018-06-03, no changelog) from http://www.malsmith.net/yori/. Yori v0.97 released, dated 2018-09-11 (changelog added: http://www.malsmith.net/yori/changelog/). There's also a user guide now: http://www.malsmith.net/yori/guide/. EDIT: after some snooping around, I was able to grab the CAB archives of latest release with these commands. * There's some things Linux commandline could learn from here, including the soft gray text for suggested file endings. That's fantastic and hard to go back from once you have it. * The lack of documentation is a concern. I don't have any idea what yerase.exe does for example. Does it wipe files? It doesn't say. webfork wrote: ↑ I don't have any idea what yerase.exe does for example. Does it wipe files? It doesn't say. Regarding portability, see below the web-installer dialog screenshot -- Yori will remain portable as long as you don't set some of the right-hand side box options. Personally, I would appreciate easy-to-follow instructions to make Yori the default system CLI. Yori v0.99 released, dated 2019-02-26 (changelog at http://www.malsmith.net/yori/changelog/).